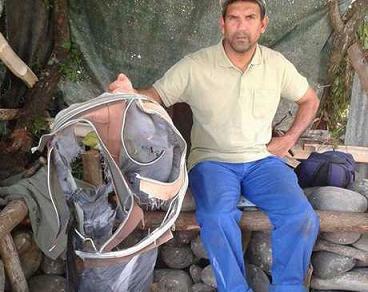 Johnny Begue, a member of a group that helps beaches clean in Saint-Andre on the French Indian Ocean island of La Reunion, holds up the shredded remains of a suitcase found the day before on the same site where he and his fellow association members also found a two-meter long part of a wing. The bag may be from the missing Malaysia Airlines flight MH370 that vanished with 239 on board. More than 150 Chinese citizens were on board the flight. Air safety investigators _ one of them a Boeing investigator _ have identified the component found so far as a “flaperon'' from the trailing edge of a Boeing 777 wing, a US official said. Flaperons are located on the rear edge of both wings, about midway between the fuselage and the tips. When the plane is banking, the flaperon on one wing tilts up and the other tilts down, which makes the plane roll to the left or right as it turns. In a statement today, the prefecture of Reunion emphasized that the source of the debris has not been identified, nor has it been definitely found to be from a Boeing 777. Flight 370 disappeared on March 8, 2014.